Student Christian Movement is a charity that helps student find vibrant and inclusive Christian communities whilst at University. Radical faith, ecumenical unity and fighting for justice are all part of what our students do, and I happen to work for them! 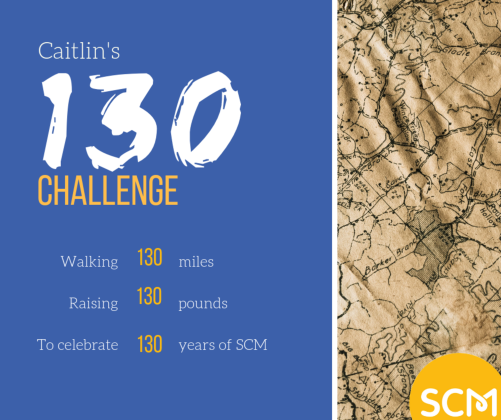 SCM is turning 130 years old this year and so I'm seeking to raise £130 as part of the #130Challenge. To do that I'll be walking 130 miles throughout Scotland, taking in some of the most celebrated scenery the country has to offer, taking students along with me and interviewing them about their faith, and making myself very very tired in the process. You can keep up to date with my walks on my facebook page: https://www.facebook.com/caitlin.wakefield.984 If you'd like to accompany me on a walk, do get in touch! Thank you for visiting our Givey page. When you make your donation through Givey, the Charity receives 100% of the donation. Your details are safe with Givey and donating is completely secure. Whatsmore, they never share your email address with any third parties except the Charity you donate to.